Exclusive: Dude Perfect and Nerf Go Gigante! You know Dude Perfect. You’ve seen their wild trick shots. You’ve probably even tried some of them at home. But today, the dudes take things up a notch — by going big on their gear. 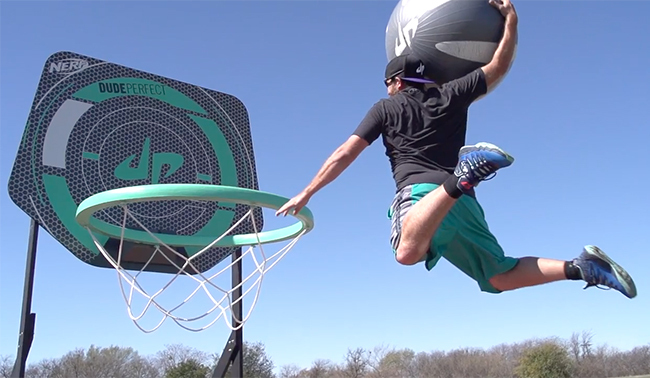 We have an exclusive look at Dude Perfect’s latest video. And in it, they use huge versions of their Nerf line of balls, hoops, and targets to put a giant twist on the trick shot. Oh, and a panda bear makes an appearance. Of course. But in case you’re worried you might not be able to try these tricks at home, the guys have you covered. They do some pretty wild stuff with normal-sized equipment, too, to help spark your trick-shot creativity.